Presently, Sri Lanka is in a state of terrible confusion with no proper constitution. The second Republican constitution, due to continuous and haphazard amendments, has been rendered a frail and disorganised statute deprived of consistency and proper order that a constitution of a country ought to have. In this context, it is an essential requirement to make a new constitution. But, the framing of it should not be based on the old outdated system. What I mean by the old outdated system is the model that had been adopted so far in framing constitutions in which the sole responsibility of making the constitution was entrusted only to the members of the legislature. People’s participation in constitution-making process is the new model widely accepted in the modern world in making constitutions. The participatory model, besides involving the members of parliament, provides for the public to participate actively in the constitution making process. It is through this public participatory system that it would be possible to effect a complete change in the system of governance rather than restricting it to a partial change. I. A constituent assembly restricted only to the members of parliament has no capacity to make a sound constitution conducive to overcoming the miserable situation of the country. a) The Members of Parliament of Sri Lanka can be considered an extremely corrupt lot who have lost the legitimacy and the decency that members of Parliament ought to have. In no country in the world, where there is a democratic political system in operation, are the representatives elected by public vote to the Legislature and the Executive allowed to conduct business with the government. They are not permitted to purchase government property, serve as government contractors and become business license holders. Such acts are perceived to be serious offences and those who commit them are even dispossessed of their civic rights, in addition to being deprived of their parliamentary seats. b) This system was in operation in Sri Lanka too, up to 1977. For example, Albert Silva, MP for Galle, who was elected to Parliament from United National Party at the general election, held in 1977, was deprived of his seat by the Judiciary on a charge of holding a Government licence in his name, for sale of kerosene. Though the law applicable to this has not been changed, it is not being implemented. A good number of Members of Parliament can be considered as those transacting business with the Government. Some of them have become big planters having bought lands belonged to the Land Reform Commission at a nominal price. Several others have become Government contractors. Some others have become Government licensed dealers in various spheres such as timber, rubble, sand and liquor business, etc. This system has invariably made politics an easy way of becoming rich through illegal means. c) This can be considered the root cause of corruption which has overwhelmed the Sri Lanka State. How can the widespread corruption of the country be controlled when the legislators themselves who rule the country had become businessmen amassing wealth through undue means contrary to the law of the country? d) In this context, a constitution that incorporates adequate provisions to abolish undue and unlawful privileges enjoyed by the Members of Parliament cannot be expected to be framed by a constituent assembly, if its composition is limited only to the Members of Parliament. This is the very reason why the proposals and regulations required for making far-reaching changes in the present corrupt system had not been included in the 19th Amendment, the new constitution being framed by the Prime Minister or the 20th Amendment put forward by the JVP. The abolition of undue powers and privileges enjoyed by the MPs in plundering public property which comes under their custody is an important and essential condition for eradicating corruption. It is therefore necessary that the proposed third republican constitution is adopted by a constituent assembly in which the public has more powers without entrusting the task only to the MPs mainly because it would not be possible to expect the MPs to endorse strong anti-corruption provisions which lead to deprive them of the undue privileges enjoyed by them under the existing system. II. The present Parliament has proved to be a bankrupt institution incapable of enacting even a simple Act of Parliament, let alone its proficiency to make a constitution which is far more complicated exercise requiring deep insight and political acumen. The 19th Amendment is a classic example for this. It has clearly proved that the present Parliament lacks experience and discipline required for framing a legitimate constitution. Recently adopted Local Authorities Elections (Amendment) Act, No. 16 of 2017 is another example. How can one expect a far-reaching constitution to be framed by a bankrupt Parliament like this? III. Simply speaking, the Constitution of a country is an agreement entered into between the people (ruled) and the ruling party specifying the fundamental principles according to which the former should be governed by the latter. In view of the fact that the sovereignty rests on the people, it is an inalienable power of people which they cannot be deprived of. In the present political context in Sri Lanka, President and the Parliament can be considered the ruling party. A constitution adopted unilaterally by the ruling party without the consent and the participation of the people cannot be considered a legitimate agreement entered into between the ruler and the ruled. IV. Making of a constitution only by the legislature is now considered a model which is extremely outdated compared to the constitution making model based on people’s participation. Even international law has recognised the participatory model as the best system of constitution making. The participatory model is being used widely by the modern world under which the public has the right to get actively involved in entire process of it, from its beginning to the end. V. In terms of the constitution of Sri Lanka and the recognised principles of constitution making, the sovereignty is in the people. Accordingly, the primary right of constitution making should necessarily rest on the people and their consent. VI. Under the present constitution, though sovereignty is vested in the people, their right to exercise it is virtually limited to voting at elections. The modern constitution making model, in addition to voting, has granted the public a variety of rights which include the right to call back the representatives elected to parliament, right to present proposals to the legislature, right to revoke laws, right to enact new laws as well as the right to submit impeachments and no confidence motions against those holding high positions in the government. Shouldn’t this be the type of constitution that Sri Lanka ought to have adopted? 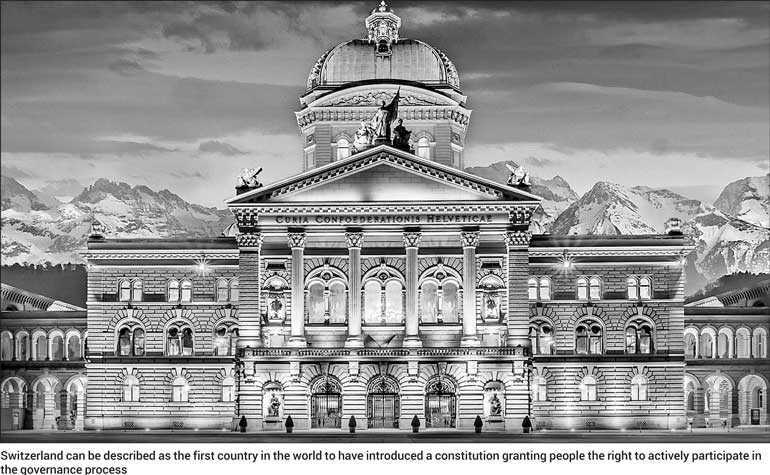 a) Switzerland can be described as the first country in the world to have introduced a constitution granting people the right to actively participate in the governance process. The citizens can influence the process of enacting laws and policy making of the government through the participatory system known as the “popular sovereignty”. The citizens of Switzerland can even influence the government to change the constitution of the country if necessary. This system was incorporated into the Constitution of Italy in 2013 and Germany in 2014. In 2016, the UK passed an act called ‘The Recall of MPs Act 2015’ that makes provision for constituents to recall their Member of Parliament and call a by election. b) The system of “popular sovereignty” practiced in Switzerland can be incorporated into the proposed new constitution that Sri Lanka envisages to adopt. All kinds of ethnic groups, community organisations, oppressed peoples and societal victims, trade unions, professional organisations, farmers, fisher folk, estate labourers, cottage industrialists, business men, students organisations, women’s and LGBTQ communities, disabled people and senior citizens can collectively make proposals to the legislative council. A truly participatory system like this will contribute immensely to prevent rebellions; help reduce labour and student agitations and strikes; discourage the trend of people leaving the country for disappointment and disenchantment; lethargy of the legislature will be reduced; reduce and weaken the power of politicians and enhance that of the people. The governance of the country to a considerable degree will become a thing of the people. It will help create an active civic society that works for their reasonable rights as well as for the common good of the country. In view of above, we should do your utmost to win over the authorities to adopt the people participatory constitution making model which gives more powers to people than the Members of Parliament in the Constituent Assembly, in making the proposed new constitution mainly because it is the only choice and the best course of action available at the moment, to effect a far reaching transformation conducive to overcoming the miserable situation that prevails in the country. It is the responsibility of all enlightened people and the people’s organisations to raise their voice and lobbying for achieving this object. If a people participatory constitution making process discussed above could be won, it will certainly help build the modern nation that ensures the abolition of recognition given for ethnic, caste and religious differences and guarantees equal respect and rights to everyone as human beings, whilst at the same time recreating the modern state in which the rule of law reigns and the widespread abuses, corruption, disorder and inefficiency rooted in the country are eradicated.